I am working on a cushion for our neighbour's birthday. She will turn 9 and has recently started to show an interest in sewing. She has been making lots of rather small (8"x5") cushions which is driving her mum mad as they get left around the house. So I thought I would make her a large (20") appliqué cushion to show her what she could work towards. The pattern I am using is by Kellie at Don't Look Now (here) because as soon as I saw it I just had to make one! 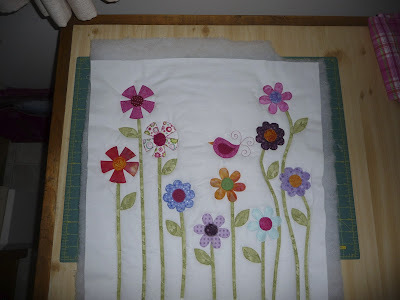 It uses the fusible raw edge appliqué technique which I have just completed. I now need to stipple quilt around the pattern. But I am scared to start this. I am still quite a novice at free motion quilting, I can do it but I get a bit jerky and loose my way. But after being at work today, up too much in the night with my 3 year old and having just fallen asleep on my 8 year old's bed whilst reading her a story, I think I might have to leave it for another day! Does anyone know of good sewing books for children? I am struggling to find a nice one that does a range of things that are not too fiddly or take too long, as the attention span can sometimes be rather short!